On the 17th of January, Wargaming streamed a special developer Q&A with Crysantos, Lordofdroid and the Lead Game Designer for World of Warships, WellDone. During this stream, lots of balance changes were revealed. Let’s go through them and discuss it a bit. A total of 12 ships are about to receive a buff with the update 0.8.0. Some buffs are more than welcomed but some others are… relatively unexpected. Now, they are buffing her sigma to 2.0. Well, let’s simply say that if someone is still able to call the ship weak, I don’t know what this person will need more. She will have both the accuracy, the punching power, the ballistic and also the tanking capacity. The only thing she is truly weak at now is aesthetic. Izumo will not be a weak and ugly ship anymore, it will be a strong and ugly ship. Thus, the battleship will have more opportunities for the use of its torpedo tubes, which will no longer be a ‘last ditch’ weapon, the use of which required to players to expose the broadside of the ship to enemy fire because of the restricted launch angles. The buff to the Kii is interesting as it’s more about the torpedoes rather than her gun power. Her main battery reload still remains longer than the reload of the Amagi but let’s be happy with this buff. I would just advise you if you see a friendly Kii near you to be careful to torpedoes. A teamkill can happen quickly. Nagato getting buffed was relatively surprising as the ship is in my books a very strong battleship for the Tier VII but I will not question Wargaming’s choices. Then again, the buff itself isn’t groundbreaking so to say. Funnily enough, Wargaming are going back on a nerf they applied recently. Now, it is quite welcome to make the slow brick that the Colorado is a bit more enjoyable. Reducing the reload time will compensate for the small caliber, making the battleship better balanced with other battleships on tier VI. The Dunkerque receiving a buff. It’s happening my friends! Now, a sigma buff or maybe a concealment buff would have been better but we will not spit on a reload buff. This will compensate for the ship’s dispersion that sometimes feels like the gunners drank a bit too much red wine. A sigma buff is truly welcomed for the Hood but now, I’m split regarding the AP fuse. It was quite useful against cruisers especially the ones with very thin armor. Le Terrible? Someone? No? Ok… Well, the Aigle is getting a buff to the range of her torpedoes. Not a buff that we will complain about but it wasn’t the most important. This buff will, however, allow her to use her torpedoes more often which can be nice as a damage source. As a side note, WellDone did announce that Le Terrible will receive a buff but they still have to determine how they will address it. Despite the fact that the destroyer has one of the best damage per minute statistics at her tier, the specific ballistics of guns often does not allow this ship to realize this advantage when engaged with other destroyers. The new parameter, though it won’t change the features of the main battery ballistics, will significantly increase the efficiency in combat with enemy destroyers at close range. It’s again a buff that wasn’t really needed in my opinion but now the Mahan will be even more effective at fighting other DDs thanks to this improved damage per minute. Now, that’s an interesting buff. The torpedoes of the Sims have always been relatively questionable as you either had a very short range with good damage or a long range but with laughable damage. With this change, both types of torpedoes become interesting in their own way. I would be tempted to prefer the 7 km torpedoes but each person has his/her own opinion. Here, it is a very welcomed buff for these 2 ships. Both are considered to be relatively weak at their respective tier so this repair party will certainly help them at being relevant. Time to grind towards the Grozovoi. The efficiency 0,5% of HP per second Adding the consumable “Repair Party” will allow for more effective fights with enemy destroyers and make the progression to tier X in this line more logical. Not that much to talk about here. This change will prepare you a bit better if you plan to grind Taschkent and Khabarovsk with the repair party instead of the smoke. To trade the smoke generator for the repair party, that is the question though. People wanted it, people received it. In update 0.8.0, fire duration on certain large cruisers has been increased from 45 to 60 seconds. This change is systemic and affects the following ships: Kronstadt, Stalingrad, Azuma and Alaska. So yes. The Kronstadt, the Stalingrad, the Azuma and the Alaska are getting a small nerf on their fire duration. It is certainly not the end of the world considering the combination of tools that these ships have in their hands. At the same time, it will make fights against them a bit better by giving a better source of damage from fires. Well now, we are dealing with the big fish. A lot of complaints were issued regarding the radar mechanic. Claiming that the consumable was unhealthy for the Destroyer gameplay out of everything else. Now, I can understand partially these complaints considering all the ships that can equip this consumable. However, I’m not a great fan of this. Let’s now talk about the change itself. At the start, people talked about a line of sight system applied to the radar. 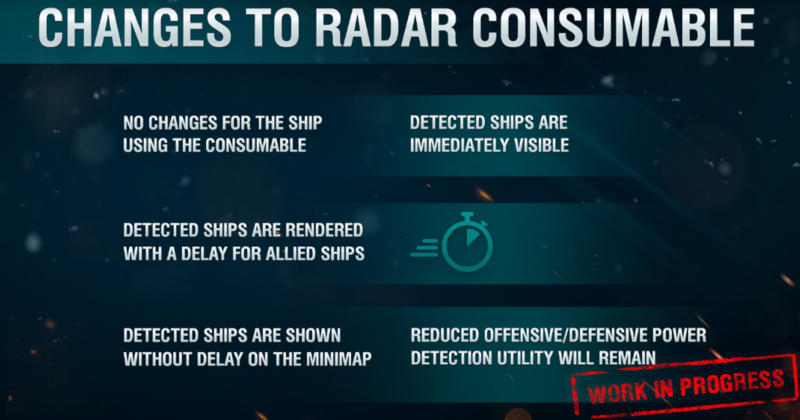 The problem is that when Wargaming tested this system, they realized that it was rendering the radar pretty much useless. Another idea was to create a delay between the time a player uses radar and the time his/her teammates can see the ship under the action of the radar. This is the idea that Wargaming seems to appreciate and that might end up on the live server. Now, I have multiple concerns regarding this change. First, the size of the delay applied to the radar. In general, when you use a radar, it’s to be able to punish an enemy ship quickly and with him getting caught off-guard. With only one ship being able to shoot at the radared ship, it’s easier to handle the situation (angling, hiding, etc.). Also, there are very often situations when the ship using radar will not necessarily be in a position to shoot at the radared ship and will rely on his teammates to shoot at it. When playing Clan battles, this kind of situations happens quite often and if that the delay ends up being too long, some radars will simply be wasted as the ship will be able to get back to cover before anyone has the time to shoot. Let’s take a wild guess and imagine that the delay is based on the percentage of the duration. That would mean that the US and British radars would become much less effective at early punishment and teamplay in general as they have the longest duration so the longest delay. Another possibility is, of course, a fixed value. This value would need to be different for all radars because otherwise, the radar for the Pan-Asian DDs will become… relatively useless considering the already short duration. Another problem is that, let’s face it, these past few weeks, destroyers received quite a lot of attention. AP mechanic change, Concealment expert nerf, the planes not able to spot torpedoes anymore with 0.8.0. and now the radar mechanic change. With all these buffs, I won’t say that destroyers as a whole were overbuffed but I’m not that far from saying it. Overall, while I can see the point of this change, I’m just not a fan at all. It’s basically bringing back the old spotting delay issue as a feature and making it even bigger. You have published this article about world of warships under the section of world of tanks. Indeed, corrected it. Thank you very much for pointing it out and sorry for the annoyance.